Are bruising and darker veins normal sclerotherapy results? I have done my first sclerotherapy treatment two weeks ago. I have healed from most bruising but I feel that the veins are now darker and more visible. Is that normal? I had to be in the sun recently, but used a lot of sunscreen and covered my legs with a long skirt. The larger veins can "bronze" after treatment, this occurs when the trapped blood stains the skin with iron products. It goes away with time. This may be what is happening. Sometimes the trapped blood can be expressed through small needle pokes which decreases the bronzing. If the dark look is in the smaller spider veins, you may just need more healing time. It takes usuallly 30 days for the body to reabsorb small amounts of blood after the injections. Have your legs checked by the physician's office who performed your treatment. Veins can appear darker after treatment. That is why we wait at least one month between treatments to allow fading to occur. Sometimes this may be due to trapped blood and removing it will improve the appearance quicker. You may have some superficial thrombosis that needs to be drained. This happens commonly after sclerotherapy. Of course you should reconsult your physician and be examined, but the veins are always inflamed, appearing in the first week or two after sclerotherapy and often look worse before they improve. That is not unusual. Do see the treating doctor to be sure nothing else is amiss. You probably have some blood trapped in the treated veins. This will almost always slowly disappear. It sounds like you are having a completely normal response for two weeks post sclerotherapy treatment. It can take 6-8 weeks and sometimes even longer for the spider veins and dark spots to fade following treatment. Keep in mind, the spider veins treated will not all fade following a single treatment. Three to six treatments are needed in order to obtain the best results. Staying out of the sun is extremely important until all darkening in the treated areas has resolved. Otherwise, darkened areas may last even longer. Yes, they always turn darker before they begin to fade post treatment. You should hope to see results 4-6 weeks post treatment, sometimes longer. finger, it did not respond and needs further treatment; if a vein persists with this maneuver, it is done and will fade in time. Yes, it is! Many of the veins that now look 'worse' will begin to fade over the next 1-2 months.You are watching the early stages of Sclerotherapy - and its often not pretty in the beginning! This is normal and will be fade. More pigmentation is common for a few months after injection. See your MD for questions about post-treatment issues. Without seeing your legs it is difficult to answer your question. That being said, however, it may be that you have trapped blood in your vessels. If so, you should go back to your doctor, as it may be possible to remove the trapped blood. Even if it can no longer be removed, the body will still eventually clear the vein, but it will take a while. In our practice we spend a lot of time with our patients so they will know what to expect at each treatment. We explain that an average area of veins can take 3-5 treatments, that veins can look worse before they begin to look better, and that there may not be too much clearing after the first or even second treatment. This is variable. Yes, they can look darker. Kudos to you for using strong sun protection. Whenever your skin integrity has been compromised (by injection/laser) you increase the chance of hyper-pigmentation in those areas if exposed to the sun. If you are having the follow-up treatment, continue to do so. We also recommend a follow up treatment at around 4 weeks to ensure all the veins (especially the deeper feeder veins) are sealed. If not, we re-inject. At this stage, we see patients in 6-8 weeks or in the fall when it cools down. Yes, it may happen. As the veins close, they trap some blood inside and may look darker. As long as they do not blanch on compression, they are closed. It usually takes 4-5 weeks to see the full effect of sclerotherapy. With the information in your question, it is very difficult to give you an exact answer to your inquiry. You may have trapped blood or may need more treatment. Without pertinent patient history and evaluating your legs in person, we are not able to say what is normal or not. Please follow up with your physician. Typically, the veins will get darker before disappearing. You may not see your full results for up to a month or so. Depending on skin tone, the veins can appear darker after treatment. This may fade with time. Its best to have the physician who did the sclerotherapy examine the result, and advise on whether to proceed with further treatment. be worth removing the trapped blood from the veins to avoid staining the skin. It is very common for the veins to be darker and more noticeable for the first 4-6 weeks after sclerotherapy. We suggest that you go back to your health care provider and have it checked. Most of the time with sclerotherapy, one can get "trapped blood" when the vein closes, and ideally needs to be removed via microthrombectomy. We also suggest that you avoid the sun during this process so the body can heal nicely. The darker appearance is from the sclerotherapy treatment. It's just temporary staining of the veins, and it will eventually disappear. It may take a few weeks to a few months before the staining will disappear completely. Yes, this is normal. Although the veins are likely "dead" from the treatment, it may take several weeks for them to fade away as they are absorbed by your body. Be patient, and the darkening and visibility should resolve over time. This is normal. 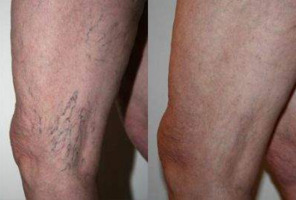 Following sclerotherapy, veins usually look worse before they look better. It takes 4 to 6 weeks for healing post sclerotherapy. You should avoid sun exposure for at least 2 weeks after sclerotherapy. Are the green veins that I have throughout my body normal? I have a lot of green veins on my legs, calves, even my arms and other parts of my body. Are those on my legs reticular veins, or could they be normal veins? They are very obvious. I never had them until my pregnancy last year. I have delivered 1 year ago. How long does it take to see spider veins vanish after Sclerotherapy? How long does it take to see spider veins vanish after Sclerotherapy? Is there any hope the veins will disappear after more time has gone by? Why is it necessary to wear Compression Stockings after Sclerotherapy? How long will it take for me to recover from Sclerotherapy? Will the length of time be longer then two weeks? Should my legs look worse after Sclerotherapy? I had 6 treatments of sclerotherappy one week apart. Much of the treatments were injecting "feeders". It's been over 2 months since my first treatment and my veins look worse. I have new quite dark veins that have popped up. What happened? I have bruising from Sclerotherapy injections that I had 8 weeks ago is this normal? It has been 8 weeks since I had spider and 1 surface blue vein injected by vein surgeon. I still have black blue spots and the surface vein looks worse, will this correct itself or do i need more treatments/ new doc?? What is in the saline solution they use in Sclerotherapy? What chemicals are in the saline solution and does it have mercury in it and if not what is in it? what are the side effects if any. Blue visible veins all over my body? I recently just noticed that all of my veins are visible all over my body, including a few in the chest area....is this normal? I'm currently on Accutane too. Is it OK to use an elastic bandage instead of compression stockings following sclerotherapy? I had a sclerotherapy treatment, but instead of being prescribed compression stockings, my doctor advised me to use an elastic bandage. Is the bandage just as effective as compression stockings? How soon after sclerotherapy can I play tennis, run, and dance? How soon after sclerotherapy can I play tennis? run? dance? How long after Sclerotherapy can you get in the sun? How long does it take for Sclerotherapy to work? I hade sclerotherapy yesterday, but I can still see a few of the veins that were treated. How long until all the veins disappear? Can I cut the feet off of my compression stockings? I just had the sclerotherapy procedure today. I would love to cut off the feet of my compression stockings. I feel like it would be much more comfortable. Would that defeat the purpose? Can Sclerotherapy cause blood clots? I've heard that occasionally, small lumps of clotted blood can be felt after sclerotherapy. Aren't blood clots quite dangerous? What can I do about a small clot of trapped blood after sclerotherapy? After sclerotherapy, there is a small section that is lumpy and discolored. My treating pysician does not drain these, is there any way to speed up the healing/fading of pigmentation? can you go in a hot tub after sclerotherapy and how long do you have to wear the stocking for? Can I continue running and moderate workouts after sclerotherapy? Will running short distances, say 2-4 miles three times per week, be of detriment to sclerotherapy procedures? What about medium distance hikes of 5-10 miles that include hills? How long after the Sclerotherapy treatment will I see the results? Would I see the results right away after Sclerotherapy treatment? If not, when wil the bruises go away? Is it normal to still see all my treated veins after 10 days? Should my legs ache 4 weeks after sclerotherapy? I had sclerotherapy almost 4 weeks ago. My legs now ache and feel heavy as soon as I get up in the morning. I have been wearing support knee highs. How long should this last? Legs didn't feel this way before sclerotherapy. How long does it take for telangiectatic matting to resolve following a sclerotherapy session? I had a sclerotherapy procedure for spider veins on lateral upper thigh just over two weeks ago at derm dr. Since that time, have noticed an approx. 1" wide area of tons of tiny new vessels just distal to injection sites. How long before this goes away?